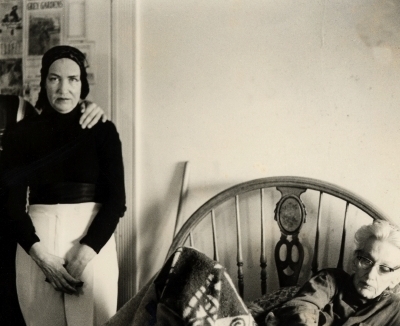 Grey Gardens – Look inward. Last month I watched the 1975 documentary Grey Gardens (for the first time). Because of the anniversary, I caught it on Turner Classic Movies. I need to watch it again as soon as possible. There is so much there in the setting, in the conversations, and in the moments of silence. “Big” Edith’s bed, in which she often sits and eats, was particularly striking for me. She keeps everything in this bed. I have a vivid memory from when I was young of once getting food crumbs in my bed. I hated the feeling so much that I never bring food anywhere near my bed. I was intrigued by “Little” Edie’s outfits and scarves. I enjoyed the singing. But the really moving part for me is that the film made me look inward. While the film can be painful to watch, it is a revelation that should force us to take a good look at ourselves. We watch these two people living in those conditions and wonder what went wrong or what was “wrong with” them. But we all have struggles. What do we show? What do we hide? How does our pain manifest itself? What is the “squalor” that we are harboring inside ourselves, and what are we doing about it?